The Goa Pradesh Congress Committee on Saturday urged President Ram Nath Kovind to provide enhanced security to Chief Minister Manohar Parrikar as the party fears that 'there may be attempts on his life to obtain files' with details on Rafale fighter jets deal. 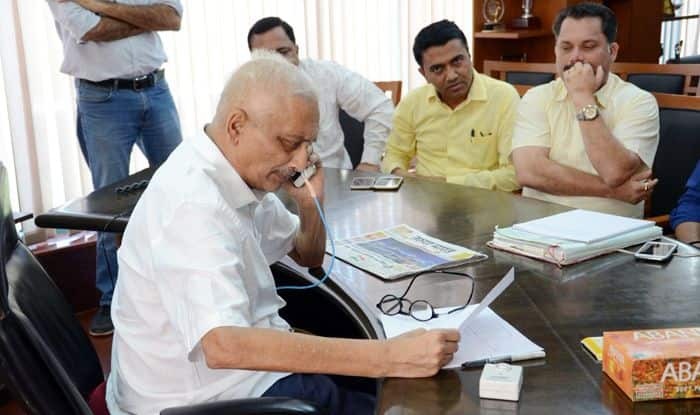 New Delhi: The Goa Pradesh Congress Committee on Saturday urged President Ram Nath Kovind to provide enhanced security to Chief Minister Manohar Parrikar as the party fears that ‘there may be attempts on his life to obtain files’ with details on Rafale fighter jets deal. “There may be attempts on his life to obtain files from those who want that details of Rafale deal should not come in public domain as corruption in the deal will be proved,” the GPCC wrote to the President of India seeking enhanced security cover for the Goa Chief Minister, who was the defence minister when the deal was signed with French defence manufacturing giant Dassault Aviation. The development comes a day after a heated debate between Defence Minister Nirmala Sitharaman and Congress president Rahul Gandhi in Lok Sabha in connection with the Rafale deal. Earlier on January 2, the Congress asserted of having audio recordings where a Bharatiya Janata Party (BJP) minister from Goa can be heard saying that Parrikar possesses all files related to the Rafale fighter jets deal. Sharing the audio, party spokesperson Randeep Surjewala claimed one among the two persons who can be heard in the clip is minister Vishwajit Rane. However, the minister has dismissed the allegations and said the tape is doctored. “Congress has stooped to such a low level that it is doctoring tapes to create miscommunication between cabinet and the CM,” he told ANI. Adding further, he had said that CM Parrikar has never made any reference to Rafale or any documents.